Photo of Colorado District tartan © Cal Clark/Thunder Mountain Pipe Band (all rights reserved; used by permission). The brilliance of the color gold signifies the vast wealth of mineral resources to which the mining industry was attracted and on which the state's early economy was built; ...The essence of the color red distinguishes the C on the state flag and also signifies the red sandstone soil which gave the area its name Colorado, meaning red in Spanish." Tartan refers to fabric woven into a unique pattern of multicolored stripes that represents a clan (family) or region in Scotland. In old Scotland, the tartan was used for clothing and as a banner or flag. Because a family or community worked the cloth together, their clothing was made of the same pattern, and so a person could be recognized by the tartan plaid that he wore. 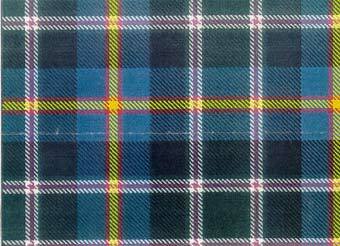 Tartans can also be designed as a symbol commemorating a special event or person. A tartan pattern is traditionally called a "sett." When woven, the sett is mirrored in all directions and defined by a particular thread count.